Replacement ACTAR D-fib slide clip for head assembly. Replacement ACTAR D-fib mouth piece (white, nose and mouth). 1 replacement cable for your ACTAR AED trainers. Replacement ACTAR D-fib head ( white only and fold-able). Replacement ACTAR D-fib chest plate. Reusable. Will not leave residue on manikins. Each pair comes with a simulated �nitro� patch. Replacement ACTAR D-fib compact 10 carry bag. Actar Dfib offers all the features needed to teach both CPR and AED (automated external defibrillation). Its fully molded upper body accommodates AED training electrode pads, and can be used for both child and adult compressions. With Actar Dfib you save time and hassle: no soaking and disinfecting are required between users; the disposable lung doubles as a face shield/barrier. Available single or in packs of 5, 10 or 25 with rolling cart and cover. Comes with disposable lungs, nylon carry bag/case, and CPR instruction CD. Instructions and CD are in English only. Replacement ACTAR D-fib compact 5 carry bag. Set of 10 replacement cables for your ACTAR AED trainers. 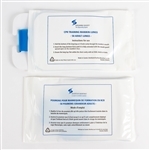 Available with a 2 CD training pack that has 18 practice scenarios for lay responders and healthcare providers and includes 5 AED Trainers, 5 sets of cables, 25 pair reusable training electrode pads, pouch for cables and nylon carry bag. AED Trainers let the whole class practice AED scenarios simultaneously. Actar Dfib offers all the features needed to teach both CPR and AED (automated external defibrillation). Its fully molded upper body accommodates AED training electrode pads, and can be used for both child and adult compressions. With Actar Dfib you save time and hassle: no soaking and disinfecting are required between users; the disposable lung doubles as a face shield/barrier. Available singly or in packs of 5, 10 or 25 with rolling cart and cover. Comes with disposable lungs, nylon carry bag/case, and CPR instruction CD. Available with a 2 CD training pack that has 18 practice scenarios for lay responders and healthcare providers and includes 10 AED Trainers, 10 sets of cables, 50 pair reusable training electrode pads, pouch for cables and nylon carry bag. AED Trainers let the whole class practice AED scenarios simultaneously. Actar D-fib manikins sold separately!